Tony Lossano, etc. : Steve & Garry, Scumbag, Worm-Meat, Idiots! 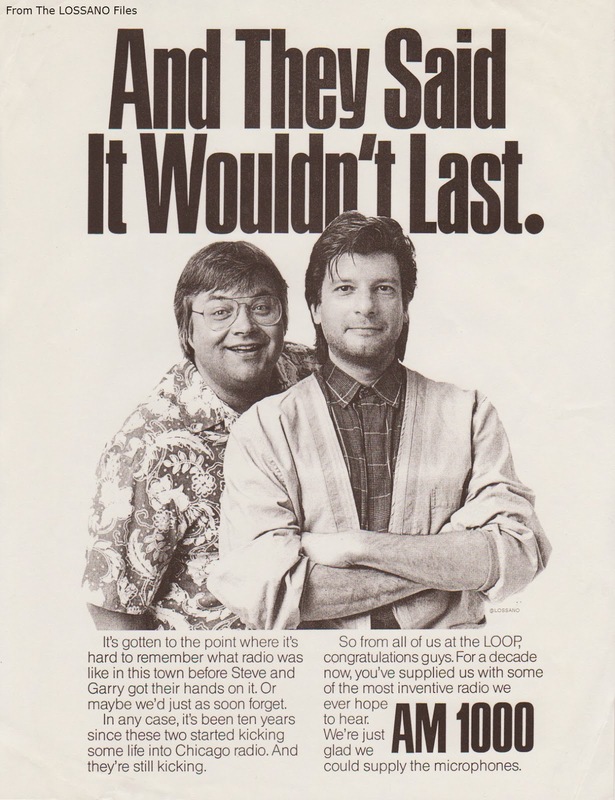 That was an ad celebrating a decade of Steve & Garry. My earliest memory of listening to their show was when my mother insisted that I turn-off, which I had playing at my 8th grade backyard graduation party. 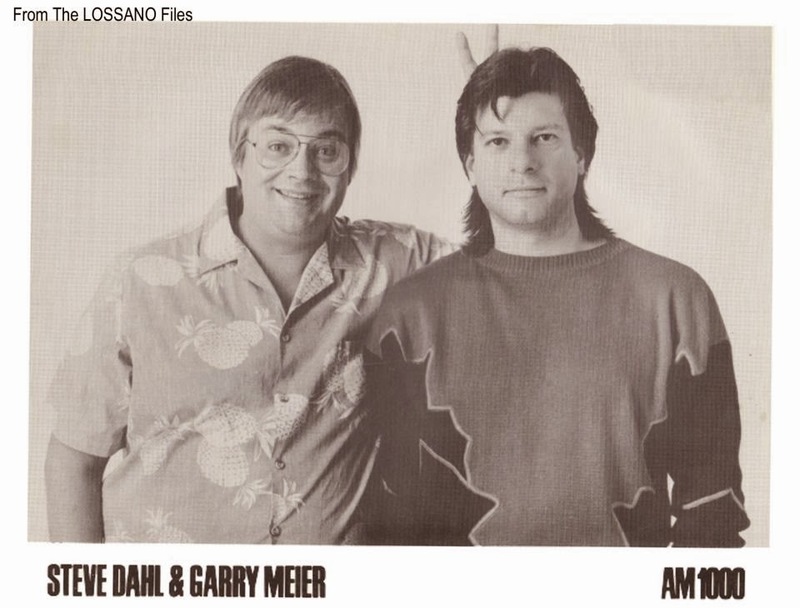 For some reason, she did not think that Steve Dahl and Garry Meier was appropriate for a family occasion. Another particular time, while in high school, I dated a gal, (who would eventually become my current ex-wife). That was when she started listening to Steve & Garry. I remember her telling me that her grandmother didn't understand the appeal of Steve & Garry. She claimed that all they ever did was just giggle on the air. For almost 15 years, they were the pioneers of comedy, talk & social commentary radio. 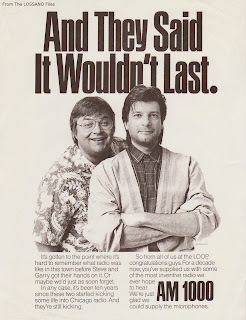 Steve & Garry were the only reason why I wanted to get into radio! They did unconventional, but highly entertaining mind-blowing broadcasts! This past summer, Bruce DuMont proudly announced that the two would finally be inducted in the national Radio Hall Of Fame. 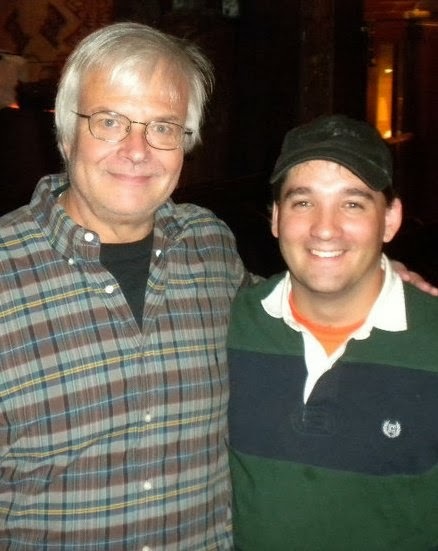 "Chicago radio legend Steve Dahl won’t be in attendance when he and former partner Garry Meier are inducted into the National Radio Hall of Fame." Steve responded with his own open letter, explaining why he still wasn't planning on attending the Radio Hall Of Fame ceremony. "I won’t be attending the HOF ceremony, not because I have any animosity, but because it doesn’t seem like the venue for another failed attempt at a Steve and Garry reconciliation." This actually lead to people asking me, (as if I have any inside information, which I don't), why was the Steve & Garry break-up so messy, still to this day. So, as a big fan, (I'm 181 pounds), I will try to explore the Steve & Garry break-up. Nothing is clear-cut, and everything written here is allegedly factual statements. Steve & Garry on tapes, CDs & online! "Garry and I won't be working together anymore." That morning, I was listening on my Sony Walkman, as I was walking to work downtown. I was stunned. As a daily listener for seven years, and a fan for life, I could not believe that this was really happening. And even though I heard that it was reported on NBC, that their break-up was just a publicity stunt, I could tell by how Steve was talking, that this was really the end of Steve & Garry. "In 1993. The alleged reason for the break-up was Dahl's on-the-air comments about Meier’s new wife, commercial real-estate broker Cynthia Fircak, while the new couple were on their honeymoon. Meier also blamed Dahl's alcoholism and unpredictable behavior. Dahl, for his part, blamed Fircak for the split, once saying on air 'When I met her, I knew the rules had just changed.'" "As the show developed, I think I played a larger and larger part, I thought I deserved to have a 50/50 split, but in the end money didn't matter at all in my decision. I just walked. - That's what finally did it, Steve's drinking...That was the seed of all of our problems, the reason that everything shattered." How much was finances really involved? At the time, it was reported that WLUP and Steve had a $6.5 million contract for five years, which Garry would receive just over $2.1 million from that deal. This was the conditions that all of the parties agreed upon. "He already hit me up for more money when they first started going out and I know that she made him." Finances seemed to be another big factor. Steve: "That's [cuz] we don't talk off the air anymore. I have to say everything on the air." "It was always kinda nice to not have him married, cause he just sorta did what I said and now he has to answer to somebody else...Cindy is nice and all of that, but of course she, like, kinda looking out for, his best interest and usually I am looking out for mine and I can get him to do what I want...I just hope that we don't get into a John & Yoko, Paul & Linda thing." Garry was Roe Conn's partner for 8 years. "I didn't call her a c##t, I just said that she had one!" Immediately afterwards, Jack O'Malley, (then Republican Cook County State's Attorney), and then Larry Wert, (then President and GM of WLUP-AM/FM), asked Steve what was he doing? Steve didn't think he did anything wrong. In fact, he said that he did not recall actually saying the c-word for many years, until others confirmed that he did. Steve has since said that he is not blameless, but he has apologized to both Garry & Cindy. "It was sort of prompted by the fact that I realized that Patrick (eldest of his three sons) was 14 and I was rapidly approaching a 'Do as I say, not as I do' situation. I didn't think I had a right to comment on [my sons'] behavior based on my behavior. Plus, once I turned 40 (in November 1994) some metabolic thing happened to me and I guess I just got old." "[Garry] made a big change in his life, he got married and I think that he wants to stand on his own two feet. And I think in the last year or so, since he got into a serious relationship and all of that, he started to resent me and all of that. And I guess that I saw it coming. I figured that we would have some problems, cause there would be some roped off areas, with respect to talking about his life, and that's that's tough for me. It's a little easier when you're single. And I don't think that he was comfortable with that. And I'm not sure that I was comfortable with the fact that I couldn't talk about things. So basically we agreed that it was time to split up." Another big fan of Steve & Garry was/is Bob Sirott. (While at Fox, Bob brought Steve on as a weekly contributor. 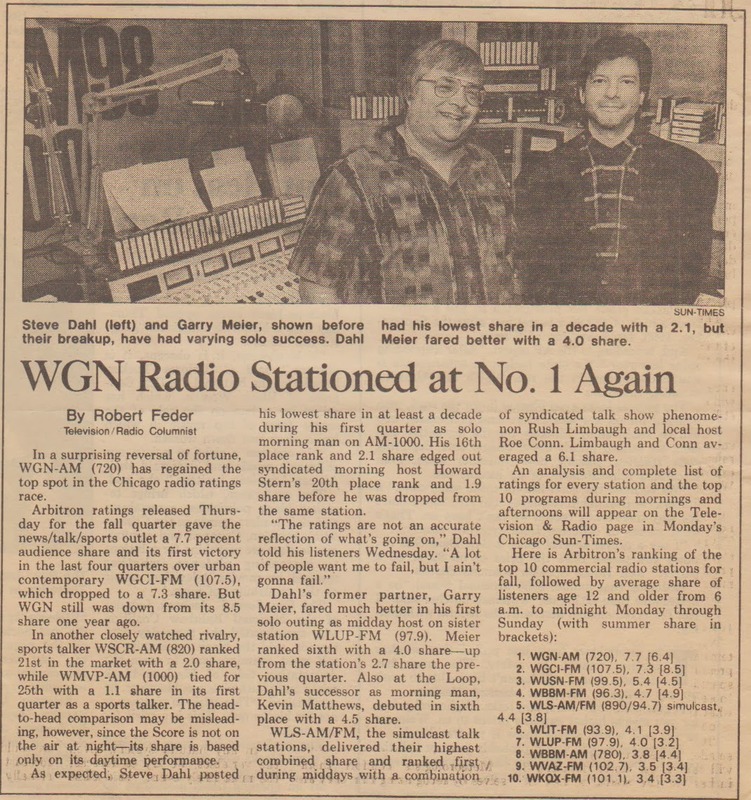 Now Bob is at WGN Radio, and he is followed by Garry.) Bob had for years tried to convince the two to reunite. Bob wasn't alone, and nothing seemed to be in the cards for that to ever happen. On Fox Thing, Bob Sirott use to drink out of a Steve & Garry mug, (which he shared with kittens). On August 18, 2006, a mere 13 years after their break-up, Steve & Garry was reunited on the air. At WCKG, Steve & Garry were once again working together, well-kinda. Garry was on the air prior to Steve's afternoon show. Things seemed pleasant. Then WCKG blew-up, real good! Garry: "It was a tough year for me and it was a tough decision to make when I did a year ago, but it was the absolute right decision as far as I was concerned, and it was a good run and..."
Steve: "Hey and we did a lot of good shows man..."
Garry: "...and that is all that you can do..."
Steve: "So, I just didn't want you to leave here without me saying something..."
Garry: "I am not bitter, it just happened...it probably didn't happened the way that everyone wanted to happened with as far as a clean break but I don't think..."
Steve: "It was pretty clean..."
Garry: "It was a clean break in that respect but it was pretty rugged when it happened and..."
Steve: "...and it got rougher...but everything works out for the best so." Garry: "That is all you can do. 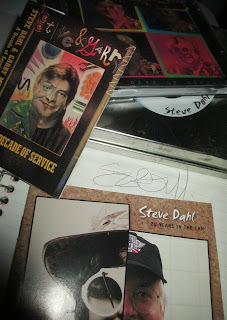 I was willing to do so much, and then things don't go beyond that point, and I think that the way that we did our show, that it probably ended the way that the energy of the show was..."
Steve: "Yeah, I suppose, well that is why I thought that I should come by and say goodbye on the air too, cause for the most part, we always did everything on the show..."
Garry: "It happened, its done, and here we go." Steve: "Yeah, I am looking forward." Garry: "I know that Steve said that we tend to do everything on the air, and I did choose a year ago not to explain all of the little details of why the break up happened, cause I do feel that they are personal, and everything does not have to be aired in public. That's the way I feel. That's the way that it is going to be. Certain things should stay private. I'm not into the mudslinging, that is not my style. And I know that I did calls and letters after the break up, saying, 'Come on, what really happened?' Well, I'm sorry, certain things can not be said. And it wouldn't be fair to him or me, and it would not improve either of our lives or your life, if you knew everything. There is nothing that you need to know that makes any difference. It happened. It's done. I will never work with Steve again. That's final. I think he knows that now. I think we all know that now. Its been a year. But, I wanted to keep whatever we did together, the best that it could be kept. And I felt that the best way to do that was just to move on and not get into this mud. And that is what I have chose to do, and that is what I will continue to do. I don't have anything to say about it. I didn't know that he was going to come in today. So I have nothing more to say. That is the way it is. Let's go on. Thank you." Steve & Garry were an amazing team together, who twenty years ago started on their solo careers, and both are still at it today. That there says it all. 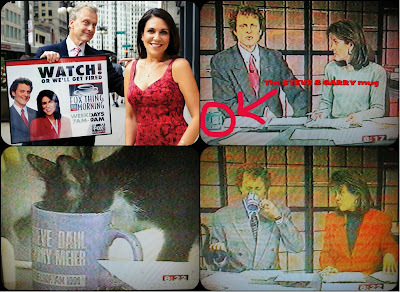 Garry Meier does afternoons at WGN-AM. Steve Dahl does daily shows for The Steve Dahl Network. 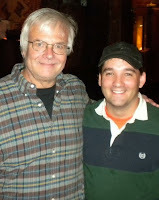 ...and me, I am a producer at WLS-FM. Thank you Steve & Garry! I am so grateful to have been influenced by Steve & Garry over the years, and I wouldn't change that...for all the tea in China, buddy!